It's that time of year again, y'all. Mardi Gras! Fat Tuesday is tomorrow, a final day of celebratory excess before the Lenten season commences with Ash Wednesday. Mardi Gras became a holiday in Europe in 1582 but didn't arrive in North American until the late 17th century. It became an official holiday in Louisiana in 1875. My New Orleans friends and family have been enjoying days of parades, bead throwing, mask wearing, and king cake eating. I definitely want to take the kids down one year to spend Mardi Gras with cousins. They would love it. Here, I've hung purple, green, and gold bunting from our front porch, and have gotten together a large basket of beads and made two king cakes for the boys' classes; I'll bring them in tomorrow, give a brief presentation about the holiday, and hope they enjoy the cake. King cake has never been a favorite dessert of mine, but I love making them each and every year. I love the smell of yeast and flour, butter, sugar, and cinnamon. 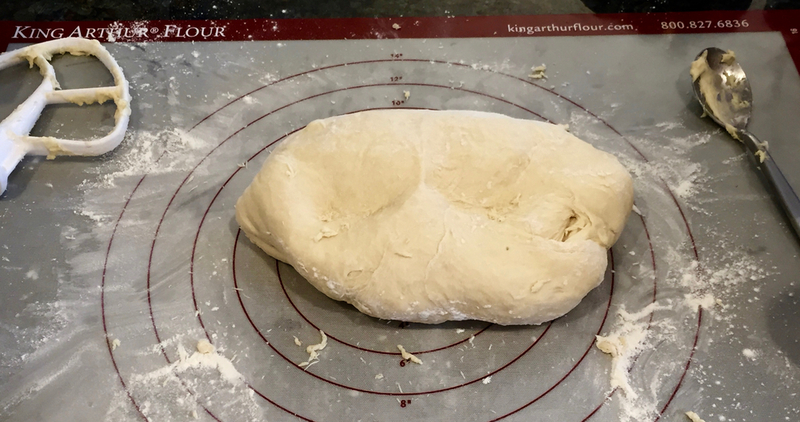 I love to watch the dough rise, to roll the cinnamon-sugared rectangles into smooth logs, to join the ends and seal the rings. This year I used Southern Living's traditional king cake recipe. This year, I let the kids decorate; naturally, they have a heavier hand with the colored sugar than I do, but really, the cakes look all the better for that.